In developed countries, excess food is available and the commonest nutritional problem is obesity. In the developing countries, lack of food and poor usage of the available food results in protein–energy malnutrition (PEM). 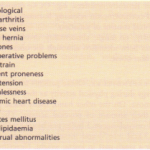 Diet and disease are interrelated in many ways. Exces senergy intake, particularly when high in animal (saturated) fat content, is thought to be responsible for a number of diseases, including ischaemic heart disease and diabetes. A relationship between nutrition and cancer has been found in large epidemiological studies. There is evidence that vitamin A deficiency may be associated with certain tumours and a high fat intake is thought to be of importance in producing cancer. Numerous carcinogens, either intentionally added to food (e.g. 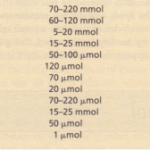 nitrates for preserving foods) or accidental contaminants (e.g. moulds producing aflatoxin and fungi) may also be involved in the development of cancer. The proportion of processed foods eaten may affect the development of disease. A number of processed convenience foods have a high sugar and fat content and therefore predispose to dental caries and obesity respectively. They also have a low fibre content, and dietary fibre is possibly important in the prevention of a number of diseases . Long-term effects of undernutrition are becoming apparent. Low growth rates in utero are associated with high death rates from cardiovascular disease in adult life. This is thought to be due to fetal adaptation to undernutrition leading to changes in concentration of a fetal placental hormone. In 1991 the Department of Health published the dietary reference values for food and energy and nutrients for the UK. 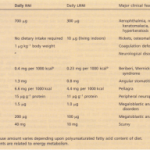 Recommended daily amounts (RDAs) are no longer used, but have been replaced by the reference nutrient intake (RN!) and two other values to provide more help in interpreting dietary surveys. The RNI is roughly equivalent to the previous RDA, i.e. sufficient or more than sufficient to meet the nutritional needs of practically all (97%) of healthy people in a population and therefore exceeds the requirements of most. Most people’s daily requirements are less than this and an estimated average requirement (EAR) is also given, which will certainly be adequate for most. A lower reference nutrient intake (LRNI) which fails to meet the requirement of 97% of the population is also given. The RNI figures quoted in this chapter are for the age group 19-50 years.